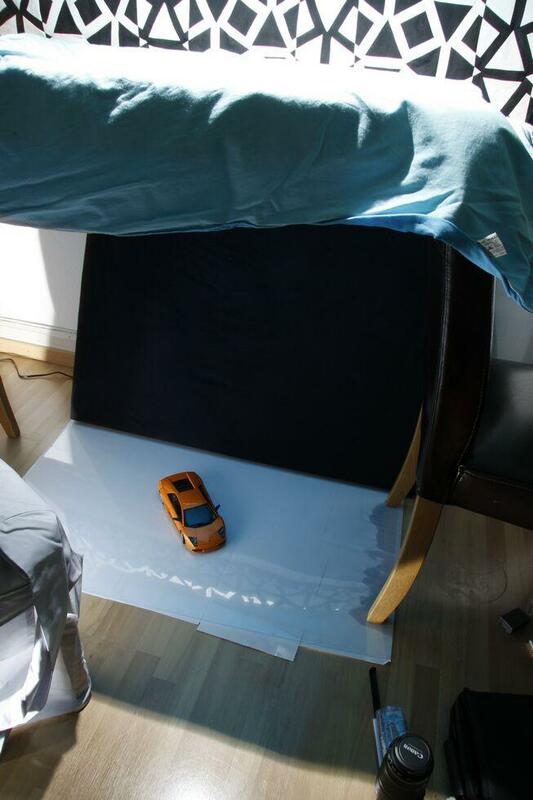 Yesterday I had the chance to take pictures of my Lamborghini Murcielago in professional lightning. What, you didn't know I own a Lambo? I got it pretty cheap. And it is really nice done, the paint is original lamborghini color, you can see the little "flakes" it has in it that shine, especially on the last picture. I wiped it clean, but I was lazy, so you can spot the dust on the hood, especially at higher resolutions. I wanted to have nice reflection on the ground, so I used plexiglas underlaid with white paper. The plexiglas also had to be pretty clean so I wiped it. Of course I could have made a bigger effort, but I was eager to shoot. The Background was just some black fabric. The Transition is pretty out of focus, so I didn't put much effort in it. I wanted to get the flakes shining, and I wanted a soft shadow on the ground. I also wanted to have the gound a slight blue, as a contrast to the orange of the Murcielago. Further, I wanted to emphasize the nice lines the car has. So I took one gigantic (compared to the model) softbox lit with a flash on top, about 1m x 1.5m. The fabric was slightly blue for a soft cast. From the right the model is further lit by a smaller softbox, white and about .25m x .25m, also by flash. Because the model is so small, an aperture of 5.6 would have made a very shallow depth of field. So I used an Aperture of 14-20. This comes at a lost of light, which was compensated by using the flashes at their full power. They were pretty hot after just 40 exposures! Another important thing was camera angle, it had to be pretty low, on a position you would expect at a larger scale.